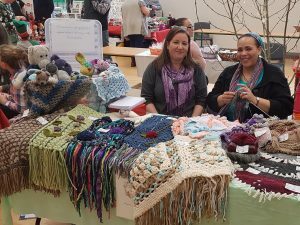 Craft Sale – If you have some creative talents, put them to good use by producing some handmade art or crafts and sell them at a school sale, church fete or Christmas market. Or you can ask in your church if you are allowed to set up a stall after a regular Sunday morning service. This can range from knitted or crocheted items, homemade jams and chutneys to hand-drawn birthday cards or paintings. Edel de Paor and her friends used their talents and raised €200 for Church in Chains in 2017 by selling these cute crochet bunnies and other lovely handmade goods at a school fair. The money was used to support Iraqi Christian refugees. Jumble Sale – Hold a sale in your front yard or garden or take part in an organised car boot sale. Have separate stalls for different types of items such as ladies’ clothing, men’s clothing, toys, books and bric-a-brac. Have fixed prices for each type of item or price them individually. It is always a good idea to sell refreshments as well! 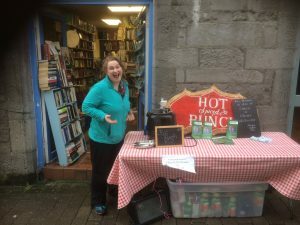 Aisling Christian Bookshop in Galway gave all of its proceeds from selling books and hot punch on a Saturday before Christmas 2017 to Church in Chains. They raised €220 in total. Thank you very much to Billy Hamilton, Maire Daly and anybody else who helped out on the day! Contact the Church in Chains office at (01) 282 5393 ahead of the sale and we can supply you with printed material for your stall.